"Everytime I have stayed it has been an enjoyable and comfortable experience." "My reason for writing is to tell you what a great job your team did for me last night. I arranged a private dinner in the Lakeside 2 room. This was the first of what I expect to become a larger and regular bi-annual series of meetings so flexibility was very much needed as we were on a learning curve. I must tell you that every single member of your team involved was immensely helpful; Asif and Karolina on arrival, Zenit and Alfonso(?) with regards to the timings and set up and even the waitresses who served our food were pleasant, helpful and cheerful. Nothing was too much trouble. Gold stars to them all. But, without taking anything away from those great people, the real star of the show was Robert, who looked after us all evening. What a great attitude and customer focus the lad has. He really made such great efforts to ensure we had all we needed; he was attentive without being overbearing and, to use some ghastly management speak, went the extra mile and delighted his customers. Two gold stars to him. In closing, I would like to tell you that, as a result of this really outstanding experience, there is no doubt whatsoever that we will make your hotel our permanent venue for future meetings. Please pass on my sincere thanks to all involved. You will be pleased to learn that ‘The Cookham Riverside’ thoroughly enjoyed their ‘Party Night’ at the Crowne Plaza yesterday evening. It was excellent throughout and I feel sure it will be an event we will support again. Many thanks to call concerned. "Just wanted to say thank you for all your help for yesterday. Everything went really smoothly, and all the staff at Crowne Plaza were so lovely and helpful. Kornelia was great at looking after us and ensuring we had everything on time. Thank you once again, and look forward to coming again in the future!" "We came on Sunday the 17th December for a family afternoon. There were 3) adults, 2) 19 year olds, 2) 15 year olds, a 12 year old and a 6 year old. I would just like to say that we all had a very enjoyable afternoon. Everyone really enjoyed the food. The DJ was very good, the kids loved it and Santa also very good. The staff couldn't be faulted. The girl doing the Face Painting worked so hard and everyone who had their faces painted all seemed extremely happy with what she did. I just wanted to say thank you. It is sometimes difficult to entertain the wide range of children we brought, but on Sunday, no one was bored." Just want to say a big 'thank-you' to all the staff at Crowne Plaza Marlow for the Festive Family Lunch on the 17th, the whole event was so good, so efficient and friendly, for all ages (we were grandparents, parents and children ages 19 down to 6 years old). Plenty of children of all ages at the event, all having a great time...the face painting lady must be worn out, she was so popular! Top marks to the disco and music, just right, and our youngest family member won a couple of prizes on the dance floor! The buffet was excellent...and a great idea for the children to have their own buffet to choose from. The older ones couldn't believe they could go back for seconds (and thirds!) plus a plentiful and tasty dessert section...who cares about calories for now! Credit to all the staff involved, can't be easy with so much going on, but they were brilliant and friendly. Father Christmas was a popular and welcome appearance and we hope that Pele gets some hair, as my youngest Grandson asked Santa especially for him!" "I am writing to thank you for the quality of service provided by your team. We sincerely appreciate your effort and gracious customer service. We have, and will continue to, recommend your service to other companies and contacts. Our team could not be more satisfied with your work, and we look forward to continuing this relationship." "2 days of back to back meetings in a typical hotel that caters for business conferences etc. Overall it was good and helped by the helpful staff. Nothing was too much trouble. It does what if says it will do. We had a great 2 day meeting and we will be back." Thank you for reserving the tables. Our event was a huge success thanks to the excellent service provided by your staff on the day. We couldn’t have wished for more. Please extend our thanks to everyone involved." "Just wanted to say that we attended the Marlow Town council event at Crowne Plaza yesterday and how much we enjoyed it, but particularly the food. I am a vegetarian and I have to say that was probably the best veggie meal I have had at a corporate do for some time so please could you pass on my thanks to your chef." "Thanks very much for all your help with our 3 days of meetings at the Crowne Plaza this week. Everything went very smoothly, thanks, and the feedback was good. Many thanks again and we hope to be in touch again when we next need meeting facilities." "I was a guest at an event and just wanted to congratulate the staff on what seemed to me to be a great job. The room was nicely set out with plenty of room where the buffet was set up, the service was good as was the food; staff efficient and friendly." "We had a lovely time on Sunday evening thanks to your planning and meticulous arrangements by the restaurant staff. Everyone enjoyed the evening, it was a most successful reunion. Those who stayed overnight were impressed with the standard of their rooms. The spa was the favourite for our young guests along with the grassed area outside and the play area. Mind you we were somewhat blessed with the weather. My thanks to you both for your work along with all the staff who made the evening so successful. who efficiently dealt with our needs without being intrusive. They were the stars of the evening. Hope you both had a good weekend and again my thanks to you both. Many guests said we must repeat the reunion. My mother would have loved the evening despite her not wanting a celebration." "We had such a great meeting and the team loved Marlow and the hotel served you proud loved the meeting room which really helped a great meeting." "The meeting went very well, the room and facilities were very well presented and the staff attentive. Thank you very much." "Thank you to you and the team last night for an excellent awards dinner. We had a wonderful evening and, although I have not had a chance to speak with many people, I am sure that they will agree that it was a tremendous success. As a charity we are tasked with raising an enormous amount of money each year, and last night we managed to raise just over £6000! Your generosity with the raffle prize and your flexibility all went a long way to helping us. Thanks again, we will be back next year!" "I just wanted to say thank you very much for hosting another prom. As always, it was a great success and the students very much enjoyed themselves! All of the staff were great and the security were very friendly and welcoming. So much so, I was wondering if I could book next year's prom!" "Just a quick note to say ‘thank you’ to you and your team for all the support last week. You helped us pull off a great event which left the team feeling energized and really motivated – thank you." "This is just a quick note to say a big thank you to you and your teams for putting on such a great event for us on Saturday night. I have had lots of thank you emails from parents saying how much the guests enjoyed it. The feedback about the hotel has been that they really liked the venue, everyone was very friendly and the food was excellent. I would be very happy to recommend your hotel for similar functions in the future and I know you made a good impression with the guests and their parents." "Comfortable clean room, nice and quiet. Conference facilities were excellent. Staff were all very helpful"
"We had a really great event, thank you for your support as well as the rest of the team, especially Debbie and Louise who were both excellent in their roles and both a real credit to the hotel. We will be sure to be in touch in due course." "Everything went smoothly. We were very pleased with the hotel. Rooms, beverages and the meeting rooms were very good. Your staff was extremetly helpfull. I surely would recommend your hotel to others." "Visited for conferencing only. Check in and out experiences positive. It was a comfortable bed and my sleep was okay. Food was excellent throughout and staff friendly and helpful. Visit was for a large conference and facilities for this were very good." "Firstly, thank you and your team so much for a fantastic stay. Your staff couldn't have been any more welcoming and attentive. Juan welcomed us in a very professional manner. Ella waited on us both evenings in the Glaze restaurant to and incredibly high standard. Pele was fantastic with both the adults and the children at breakfast. The room was comfortable and spacious with adequate facilities. 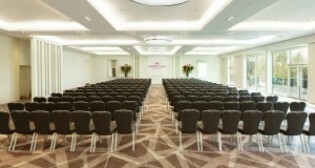 I wouldn't hesitate to choose your hotel for future events in and around Marlow." "I want to say a huge thank you to you and the team at the Crowne Plaza . The team, Karolina, Karen, Nick, bar staff etc made our event a success so many thanks. Everybody enjoyed it from the moment they got there. A special thanks to you, you made our event happen from taking my brief and informing your staff was faultless. Thanks once again you were a star." "Just wanted to say thanks to you, the chef and all the team for helping to put on an excellent party last week. We all had a really great time!" "The event was a great success and everyone loved the hotel! Your team onsite were very helpful - a pleasure to work with. Hopefully we will see you again in the future for another conference or event, we certainly wouldn't hesitate to come back after such a positive experience." "A very big thank you for hosting last night’s meeting, it was a good atmosphere, very relaxed and several people joined in with varying items of news etc. which is what we are aiming for. Please thank your staff for all their help and in particular the chefs who provided the food which was lovely – much appreciated by me for the vegetarian option – don’t always get that. Obviously that is not what the meetings are about but it does make it very enjoyable and people stay and network. 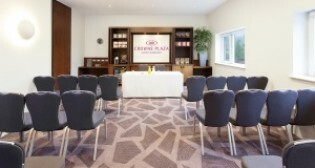 Many compliments about the Crowne Plaza from members so well done and thank you again to you all." "I wanted to say thank you to you and your team at the hotel for making our Awards Dinner last night such a success. Great Marlow School Boat Club have held our dinners at the Crowne Plaza as you know, since their inception 5 years ago. I have to say that last night your team were excellent and the food was a good amount, tasty and hot. The dessert seemed a success too. Please pass on my thanks also to Nick , your General Manager, whose presence at the start and during service was reassuring - I believe I spotted him helping the team at the pass at one time, always a sign of good teamwork!" "We had a lovely time on Saturday with our family and friends celebrating our Golden Anniversary. All our guests really enjoyed the meal and the service was excellent especially the attention of the Head Waiter/Manager. Thank you for your help and advice."